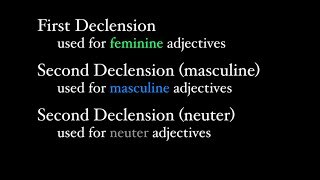 There is a set of adjectives in the first and second declension that doesn't quite follow the standard set of rules. 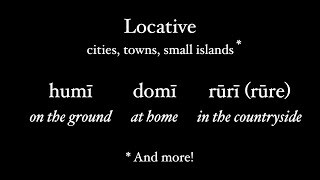 We call these pronominal adjectives, because they function more like pronouns than describers. 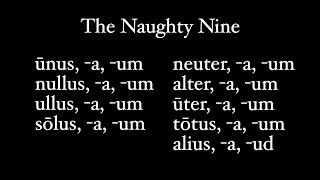 But you can refer to them as the Naughty Nine, or with the mnemonic UNUS NAUTA. Adjectives are always bothersome. We know they describe nouns, but in Latin they take the same case, number, and gender as the noun they modify. 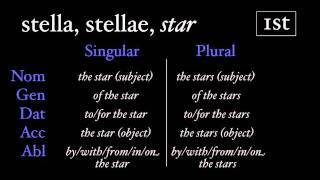 This can be easy if the nouns is of the same declension, but a bit more tricky if we cross declensions, where a 1st/2nd declension adjective modifies a 3rd declension noun: magnus leo. 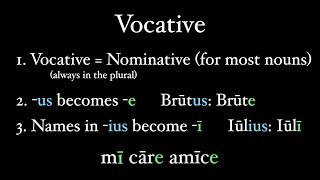 This may be the first thing you ever learned with Latin, and the first is always the best. 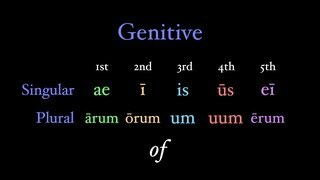 This video covers the declension of first declension nouns, how they are translated, and other peculiar features of the a declension.